My interests are very broad, and I wanted to explore many options. I have not quite decided yet on what my exact future plans will be, but I have narrowed it down to two paths—either go to law school or go to graduate school to become a social science researcher. My summer experiences helped me understand a bit more about both career paths. As an intern at ACCESS Health International, an international NGO that works with private and public healthcare leaders to improve high quality healthcare access for all. I conducted research on the Chinese healthcare industry and market, analyzing the recent rise of private investment in Chinese pharmaceutical companies. I also closely studied how foreign pharmaceutical companies can leverage the large quantity of Chinese medical data available for their domestic drug discovery efforts within China. This experience shaped my views on the future of the Chinese health care industry and how regulators like the CFDA can adopt more progressive policies to better facilitate drug discovery within China. At the conclusion of my internship, I was fortunate enough to be able to assist my colleagues in publishing a Chinese paper about the state of healthcare in China. I am thankful to the ACCESS Health International team for the support and lessons they provided me. I also worked on a research project funded by the Dean’s Undergraduate Research Fund on live-streaming in China and people’s motivations for using platforms such as YY.com. My initial inspiration came from a piece of news I read from Renmin about a big government-planned crackdown on internet live-streaming platforms. This industry has recently experienced massive growth: gaining millions of users over the past two years. I wanted to know why so many people were turning to live streaming, and wanted to gain a deeper understanding of “freedom of speech” in China and ideologies of the majority. My research partner and I also took a close look at how live-streaming platforms and how live-streaming personalities respond to changes in Chinese public policy, like heavier supervision over content. ​SideChef is a popular cooking companion app that provides recipes and step-by-step instructions, so even extremely busy people can prepare affordable and delicious meals from their home. I worked part-time on SideChef’s content team to help them upload content onto their platform and also attended regular meetings with the great people at their Shanghai office. While working at SideChef, I learned the importance of effective time management. 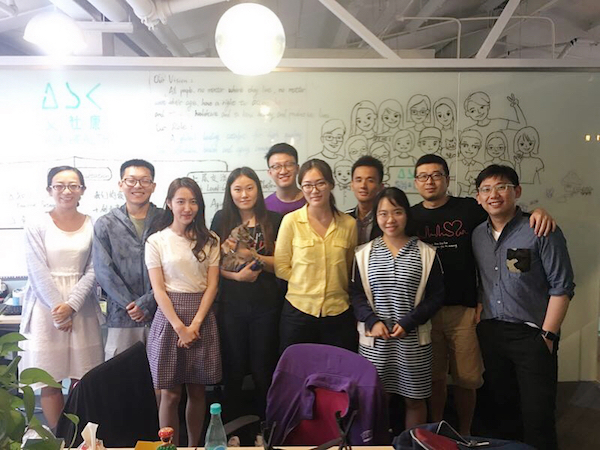 Juggling a workload with classes at NYU Shanghai can be straightforward, with accommodating teachers, and class schedules that are previously agreed upon. I found the real working world to be much less forgiving. This was an important growing experience for me. I have learned to take detailed notes of future meetings and tasks in my planner to ensure I can budget my time properly. Fortunately, I did end up finding some free time once I got the hang of everything. I helped some other NYU Shanghai students take care of a kitten that the NYU Shanghai community has adopted, and also got to catch some films at the Shanghai International Film Festival (SIFF). As someone that loves animals and cinema, this was time well spent! During less eventful weeks, I would spend much of my free time visiting my favorite Shanghai cafe, PARAS. I also hosted my mother for a week in Shanghai and gave her a tour so she could experience one of China's most beautiful and vibrant cities. This semester, I will be in Washington D.C. for NYU’s Global Leadership Scholars program. I could not be more excited. This program will allow me to attend classes at night and gain valuable work experience by interning during the day. I will be interning for New York Congressman Hakeem Jeffries. I hope this opportunity will give me first-hand experience of work culture in Washington D.C. and help me develop an understanding of the US legislative process outside of what I have learned in an academic setting. Most importantly, I hope to meet interesting and passionate students through the Global Leadership Scholars program. I am grateful to NYU for providing me with this opportunity and even more grateful to my mother and the rest of my family for supporting me in everything I do, even when it means I will be thousands of miles away from home. To explore job and internship postings and to schedule career coaching appointments, log in to NYU Shanghai CareerNet. For more information, please contact the Career Development Center at shanghai.careerdevelopment@nyu.edu.